Inside: Water bill increasing? 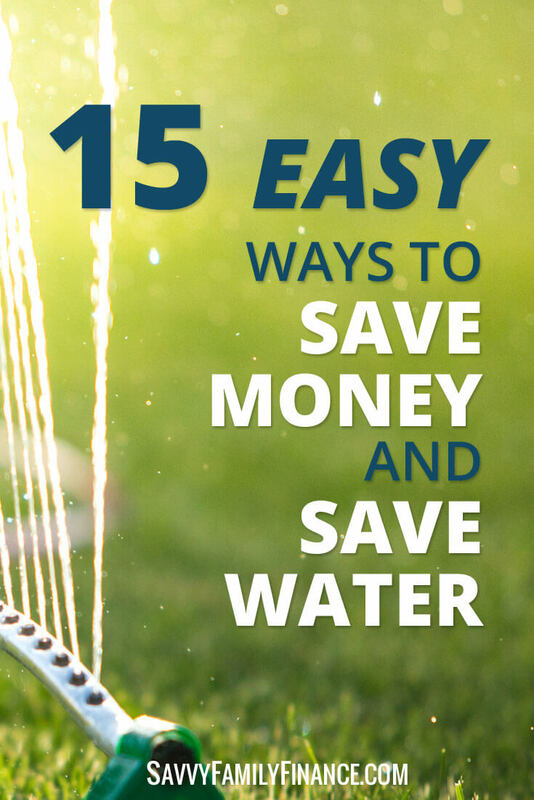 We have easy tips on how you can save money by saving water. Your water bill has likely been going up, and it won’t stop anytime soon. Whether due to drought, aging infrastructure needing repair, or other causes, water costs more. In fact, rates have increased 48 percent since 2010. And if your water bill includes sewer and stormwater as well, your bill is likely even higher. In fact, in my area the sewer charge is over twice as much as that for water. How does your water usage stack up against others? According to the USGS, the average person uses approximately 80 – 100 gallons of water per day! You can figure out how much your household uses by checking your water bill. I looked at ours and we use under 25 gallons of water per person per day. Showerheads pre-1992 would often have an output of 5 gallons per minute (GPM) or more. Today’s low-flow showerheads are rated anywhere from 1 – 2.5 GPM and you get just as clean and can still have a nice strong spray. We updated our 1960s bathrooms and installed a couple different showerheads, each with great spray options at only 2 GPM. Plumbing supply stores usually have some on display for you to try. We went with nice, yet affordable ones from Delta and Kohler. You know that screw on screen thing at the end of your faucets? That is the aerator. If your faucet is old and doesn’t have one at all, it is most definitely NOT a low flow faucet. These days, kitchen faucets normally have aerators rated at about 2.2 GPM and bathroom faucets at 0.5 – 1.5 GPM. If you suspect your aerator is old and not very efficient, unscrew your current one and take it with you to the store to ensure you get the correct replacement size. If you have an older toilet, it probably uses 4 gallons of water per flush. You can adjust the water level in the tank by placing a half-gallon jug of water in the tank. Don’t use a brick – it will break down and leave sediment in the tank. If it is time to replace your toilet, the savings on your water bill could make it so the new toilet pays for itself quickly. We installed ones rated at a measly 1.28 GPF (gallons per flush) and they work great. There is actually a flush rating system, and we chose models with scores over 800. This is one we need to do this summer. If your shower is like ours and takes a couple minutes before the warm water starts flowing, you could be collecting the cold water in a bucket to use rather than letting it go to waste. Use the pre-shower water to water plants, garden, or even for your pets. I know I always feel a bit guilty about that wasted water, so might as well put it to good use! The numbers vary a bit depending on where you get your information, but the average amount of water a person uses when taking a bath ranges from 35 to 50 gallons. I’m going to guess for little kids it will be less. You can calculate this for yourself by taking a 1-gallon bucket and timing how long it takes to fill. Now run yourself a bath and time how long it takes to fill to the level you normally use. So how about a shower? If you have an old 5.5 GPM showerhead and take a 10-minute shower, that is 55 gallons. Ouch! Reduce it to a 5-minute shower and you are ahead of the game. If you are using a fancy yet affordable new 2.5 GPM showerhead, a luxurious 10-minute shower will use 25 gallons of water and a 5-minute shower will use only 12.5 gallons. Unless you are bathing the little ones, for daily cleansing, showers beat baths overall for water savings. If you are like us and aim for showers being only 3 to 5 minutes with a 2 GPM showerhead, it’s even more of a win. In fact, it is probably the easiest way we save money by saving water. Not only will you save time, but you’ll save a lot of water by not pre-rinsing those dishes. Scrape off the food bits, and let the dishwasher and detergent do the rest. The detergent is designed to work with food particles and dishwashers today are much better at cleaning than older models. If you think washing dishes by hand saves more water than using a dishwasher, you are likely mistaken. The exception may be if you live on your own and don’t fill the dishwasher. Today’s dishwashers are much more efficient and the most efficient ones use only 3-5 gallons of water per load. The National Resource Defense Council states that most hand washers use upwards of 27 gallons of water per load. Yikes! If you have a leaky sink, that drip could waste as much as 20 gallons of water each day. The fix is likely a washer that costs a few cents. Do you suspect a leaky toilet? You can find out by putting a few drops of food coloring in the tank. In 30 minutes, check the bowl. If the color has transferred to the bowl, you have a leak that should be repaired. Most parts can be purchased inexpensively at your local hardware store. Saving water can be as simple as turning it off while you brush your teeth and wash your face. It will still be there when you are ready to rinse. Rather than keeping the water running while you shave, fill the sink part way with water. You can then rinse your razor in the sink rather than under running water. You’ll save water and, for some reason, the gunk actually comes off the razor better for us this way. When possible, wait until you have a full load before running your clothes washer or dishwasher. The appliances will use nearly the same amount of water full or not, so save water by waiting until you can fill the washer. Wherever you live, plants that are native to your region are adapted to the area. This means they require less attention and watering than other plants. Xeriscaping is another good way to design your landscape using drought tolerant plants. Unless you live where the HOA dictates you must maintain a green lawn, try letting it just go brown and dormant over the summer. Once the weather cools and the dew and rains return, it will perk back up. If you must have a green lawn, try planting using seed that is drought tolerant. Also, grass usually only needs about 1 inch of water every week. If the water is running off your lawn and watering the pavement, you are using too much water. When you water your garden, either wake up early or set a timer on your sprinklers so the watering is done early in the morning. This helps reduce water loss from evaporation and reduces chances of mold growth that might occur if you water at night. Also, check the weather forecast. It always amazes me when I see sprinklers on in the middle of a rain storm. These tips work! And they are easy to do. Our family uses 75% less water than most and we still have a garden, we shower daily (sometimes twice) and have loads of laundry going most days of the week. Conserving water isn’t a sacrifice. It becomes routine and you can do it without much thought. As a bonus, you’ll be saving money rather than letting it flow down the drain. What are your tips for saving water? I have not done this yet, but I want to get a rain barrel to water my outside plants.